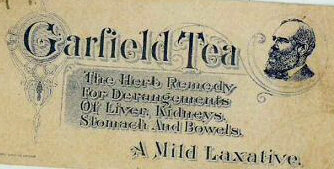 Garfield Tea-What was in that stuff? After passing a miserable night on August 2, 1892 due to stomach cramping and vomitting, Abby Borden went across the street to Doctor Bowen for a remedy on Wednesday morning and voiced the opinion that the family may be poisoned through the baker’s bread. He sent her home with directions to give castor oil a try, while Andrew Borden, too frugal to waste money on office visits, dosed himself with an over-the-counter preparation called Garfield Tea, named for the assasinated president. 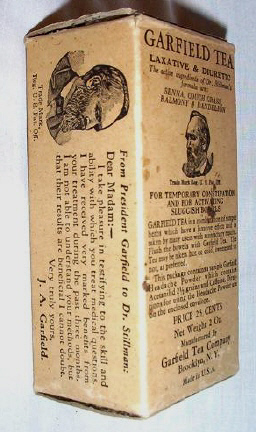 Manufactured by the Stillman Remedies Co. of 58 West 55th Street in New York, the concoction was made entirely of herbs, chiefly senna leaves and crushed couch grass. The price of a box was 25 cents and the tea was made by putting a teaspoonsful in a cup, covering with 8 ounces of boiling water, and allowing the mix to steep for a couple of hours. Taken before retiring, it promised relief from liver problems, constipation, and stomach upset. Andrew was still looking feeble on the morning of the murder, Thursday, August 4th in spite of his self medication although Abby was somewhat improved.